Straying from one-dimensional art, Ilya Zaidze utilizes mediums of virtual reality and 3D modeling to produce creative websites and unrivaled marketing. His work is demonstrated through AWGE, led by Asap Rocky, and through Revenge X Storm, head by Ian Connor. Along with Ian Connor, the all-around fashion figure and the king of youth, Zaidze is a pioneer in introducing 3D scanning for garments—in this case, Revenge X Storm’s shoes that incorporate mysterious Vans Old Skool-type silhouettes. As creative director and consultant of GenZi, his collective of creators, Zaidze manages his team of artists to contract and produce for upcoming companies and brands. This past Summer, Ilya Zaidze collaborated with Pas de Faux co-founders, Caleb Castillo and Ryan Friedlinghaus Jr, to produce an experiential installation at their pop-up on Melrose. 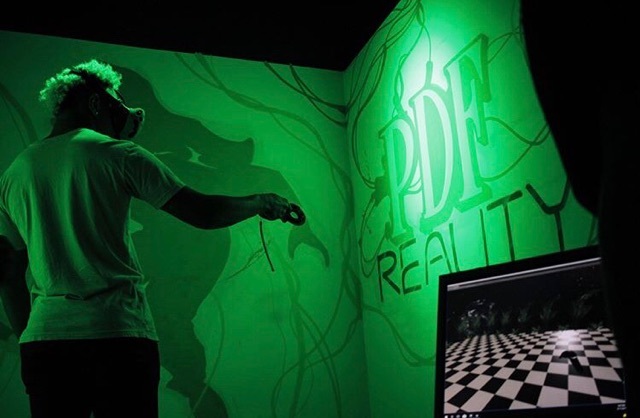 This event featured a VR room to offer visitors an unparalleled method of trying on clothes in a different physical realm. Ilya Zaidze’s creative processes and productions are revolutionary and rebellious in the most attractive way. Your earliest accomplishment was launching Gif Plug. What was your motivation in creating this platform? Gifplug is a social network I developed. I found myself on Tumblr a lot spending hours and hours liking gifs and reposting them. There wasn’t a concrete platform for users to post and share gifs—a gif-only platform. A year after of working on it from the original starting point, we did a soft launch, a data launch. We wanted to keep it low key and bring minimal attention to it because we only wanted to dip our toes into it to see how people reacted to it. Since August of last year, we’ve been working on fixing all the bugs and redesigning the backend, so we’re expecting to launch within early 2018. We have a whole roll-out strategy to launch this on a bigger scale while bringing in a household name by having gif collaborators and exclusive content. How did you get interested in using mediums like graphic design, Web VR, 3D scanning, 3D modeling, virtual reality, and augmented reality? I didn’t know that I was going to do this. I’ve always had an interest in tech, music, and art. My Junior and Senior year of high school--it got more serious. I was creating mood boards, visualizing concepts for clothing, for album art. My mind was racing at a hundred miles per hour. I was also in AP Art class, so I was developing a more traditional approach. As I was working to expand my creative palette horizon, I was developing skills that were imperative to the whole process. It’s all about having the right people and the resources to execute your idea. Without proper execution, your ideas don’t mean much. It’s all about access to the right information. We are meshing the thresholds of creativity and technology. We always think--how do we blend these two mediums together and leave a lasting impression on people? How did the beginnings of Revenge X Storm come about? I met Ian Connor on the street. I was on Melrose and I was talking to his assistant. He ran up behind me and he overheard and said, “Yo I want to work with you. I was just with Carti shopping around.” I gave my contact information, and not until another two-three months later, I see him on Fairfax. So, it was two to three random meets on the streets—not coincidental. I don’t believe in coincidence at all after my life experience. That started turning into a working relationship, since I had a lot to bring to the table. Ian and I teamed up and started working on Revenge X Storm project. I was overseeing development, and I designed the website. I led the creative direction for the brand starting off with its Instagram to the site. Through that, I think I gained his trust and his creative impression. I was able to be part of Revenge’s construction and building it to what it is today. With Revenge, through the website with the shoes, we introduced the trend of 3D scanning garments. We were the first brand to have 3D scanned shoes. Ian Connor is known as ‘The King of the Youth’ and his insane influence as a crazy curator. Off the bat, a lot of kids were looking forward to this project. After we did a few feature ops and launched a few colors of the shoes, things got leveled on the playing field. How did you connect with Rocky? What do you think he saw in you? I met Rocky at last year’s Art Basel. I got a call one day from Ian saying, “Yo, pull up to Rocky’s house right now” I drove straight there. Off the bat, Rocky sits us down and says, “we need an AWGE website.” Up until that moment, they didn’t have a website. It was very unknown. The only people who knew about Awge were cult followers of Asap, Ian and Asap Mob. We have a meeting for three hours in his living room. He was telling me about his vision, references, inspirations, colors, and even literature. He was showing me around his house. He had this room with a shag carpet on the floor, bunch of arcade games, neon signs, and photos on the walls. The concept of the website was taking inspiration from the old Street Fighter games and the original Macintosh to create this whole retro tech vibe. Off that meeting, I had notes and an idea already formulating for the user experience. Ian made that parallel to work for AWGE. A simple way to explain it is a creative agency or collective. But AWGE is bigger than that, in terms of the people, their team, their vision, and their legacy. They’re able to indirectly influence not just people and their minds but the market and the world around them. A lot of talented people are working for them. They have a lot of cool projects on hand for them and guest list of collaborators, led by Rocky who is on a high pedestal. He’s leading this division and hand picked his team with individuals he genuinely likes. They work together as a collaborative effort to create meaningful projects. How did you execute your recent pop-up collaboration with the brand, Pas de Faux? 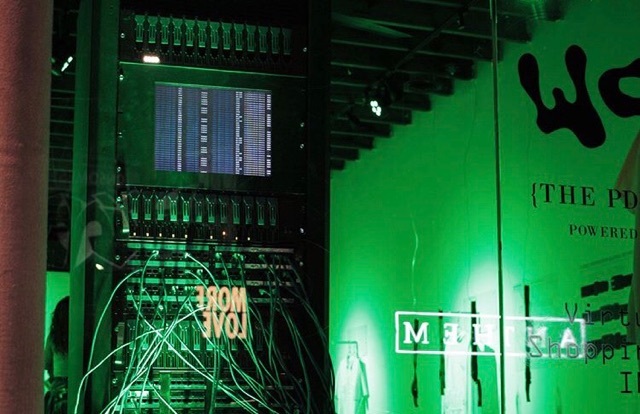 We created the first ever pop-up virtual reality installation. We 3D scanned the PDF collection and imported those to a custom virtual environment that we built, and that I fully designed. There was a VR room, and we had a whole set up so clients could put on the headset and walk around the environment to see all the clothes, pick up the clothing, and see how they fit. We are going forward with VR shopping experience in other realms. Is that a possible project for AWGE? Anything is possible with them. Yes. 2018 is going to be major. can i put some coins in?